I'm In Rotorua where Aotearoa Quilters exhibition , The Great New Zealand Quilt Show is on at the events Centre until tomorrow. 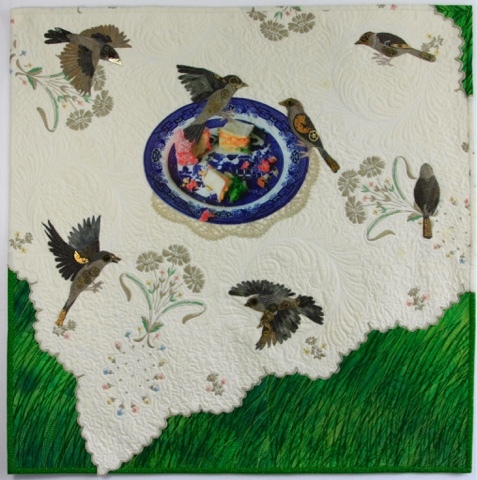 My quilt was accepted as one of 20 quilts in the Flight Challenge exhibition. I thought I would I might talk about how this quilt was made and how accidents change how a quilt ends up. I took a photo of a willow pattern plate I own, the willow pattern design is hundreds of years old so I felt it would be long out of copyright and therefore ok to use. I reversed the image and had it transferred onto the centre of the tablecloth but didn't get the plate at the right angle so had to cut it out and reapplique it into the middle. Unfortunately that meant that the hole in the centre was bigger than the plate being appliquéd so the doily under the plate hides the gap. I machine quilted the top before adding the sparrows. I used a feather quilting stencil to mark the pattern for the plate shapes, I'd never tried to follow a drawn pattern using machine quilting before. Usually I just machine quilt freestyle. I threw bits of lamington ( a New Zealand style of coconut and jelly covered sponge cake) and bread on the driveway and took loads of photos of sparrows using a telephoto lens by hiding in my garage with the roller door nearly closed. It's really hard to take photos of sparrows- they move so fast and having 2 cats probably makes them jittery. Looking forwarded to seeing what she does with her set. Anyway that's the story of the steampunk sparrows quilt.